Yak farming, an integral part of the highlanders is on a declining trend in the country, with many of them settling in the villages and opting for other means of livelihood. But in Dhur Village of Chhoekhor Gewog in Bumthang, the number of yak herders has remained almost unaffected by the ever-changing lifestyle of pastoralists. 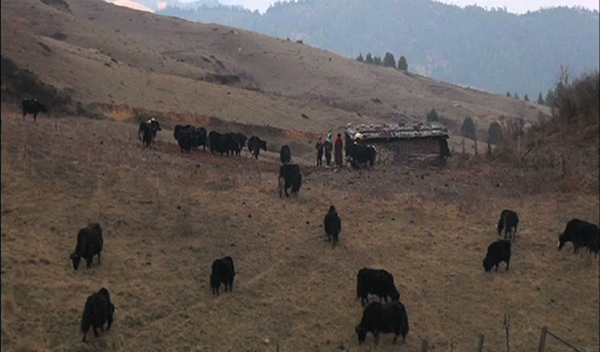 At present, Dhur has 17 yak herding households. From the initial 20 households, only about three gave up the tradition, settling in the villages. They spend their winter months in and around their village. By next month, they will move to high altitude areas towards Gangkar Phuensum and Dhur Tshachu. Sonam Choden and her family are waiting for the migration period. These days her daughters get to enjoy some talk time on mobile phones and listen to the radio. These facilities are inaccessible once they move further north. “Once we reach our summer pastureland in the north if someone falls sick, it becomes really difficult for us to get any services. As we can’t access mobile network and we are too distant from our village,” she said. She added life as a yak herder is a challenging one. Also, improper solar power facilities and degrading migration routes have been posing challenges for the yak herders. Today, they use very small portable solar panels to light their hut. “In the past, the Dhur community used to carry out maintenance works of our mule tracks and bridges. Now we don’t receive any maintenance budget from the government. This is especially difficult for us while moving from one place to another during the summer with the swollen streams and rivers,” Dorji Samten said. With the challenges, the elderly people of the community are worried that the tradition might not survive a few decades down the line. Therefore, there is an air of uncertainty surrounding the survival of the remaining households. “Once I become too old and incapable of tending the yaks, I feel the tradition would die out. The children are not interested in yak herding. 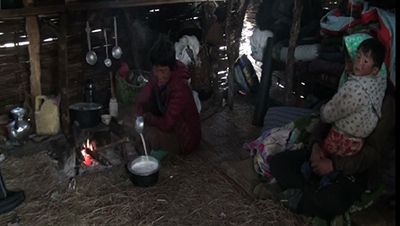 They say it’s a difficult life living in the mountains with the yaks,” Sonam Choden said. “Like anywhere else, with time, yak herding might decline in Dhur as well. With the children going to schools it’s only the older generation who look after the yaks,” Dorji Samten said. Except for another 17 households of yak herders in Chhoekhor Toed in the dzongkhag, the practice has already died out in Tang Gewog more than a decade ago. In Ura, with only one household remaining, the tradition is virtually extinct as well. According to the National Highland Research and Development Center in Bumthang, yak herders in Bumthang were provided with milk processing equipment and pasture seed last year. The centre also said they distributed CGI sheets for yak herders in upper Chhoekhor recently. As the Sustainable Livelihood Program is one of the flagship programs in the 12th Five-Year Plan, the centre also added that there are various plans to address the challenges faced by the yak herders in the country. But with changing ways of life, improved livelihoods and the youths uninterested in taking up yak herding, the elderly people say, yak herding might just disappear from their way of life in the next decade or so.